For years, American Horror Story creator Ryan Murphy teased the interconnectedness of his madcap, macabre universe. Beats of each season would parallel and even call back to previous installments, despite existing in isolated worlds -- Sarah Paulson even reprised her role of Billie Dean Howard from Murder House (Season 1) on the finale of Hotel (Season 5). When Season 6 crept into view, many wondered if it would be a culmination, a theory strengthened by each of the first five episodes of Roanoke echoing their respective numerical seasons. This may have been more of a game; so far, we haven't seen anyone from the past show up in the present. And we may not when Roanoke wraps up -- according to Murphy, the crossover craziness is set for a future season. During a Sunday panel at Entertainment Weekly's Popfest, Murphy divulged that he is planning a direct team-up event, culling from seasons past. "It’s not going to be next season," he explained, "but we are going to do a season that’s a crossover between Murder House [Season 1] and Coven [Season 3] together, which is very bizarre." Murder House starred Connie Britton, Dylan McDermott, and Taissa Farmiga as the Harmon family, who encounter, battle, and befriend the paranormal inhabitants of a haunted mansion. 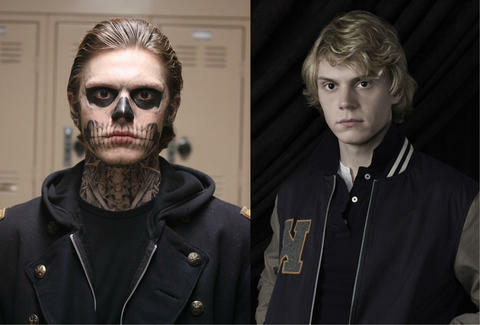 Jessica Lange and Evan Peters costarred as Constance, a meddling neighbor, and Tate, a psychopathic teen ghost, respectively, and both jumped to Coven, Murphy's New Orleans-set exploration of witchcraft, voodoo, and Hellish ritual. Farmiga and Murder House alumni Sarah Paulson, Zachary Quinto, Lily Rabe, Frances Conroy, and Denis O'Hare also stuck around for the third season, which added Emma Roberts, Gabourey Sidibe, and Kathy Bates to the cast. Roanoke may wind up playing a role in connecting the two seasons. Murphy confirmed to EW hat Lady Gaga’s druid character, whose lifespan stretches from the first American colonies all the way to present day, is in fact the first "supreme," the top witch position established in Coven. Murphy also said that November's finale “is the wrap-up to Roanoke but the mythology and some of the characters will continue in subsequent seasons. So it’s the ending but not the ending." Can we expect The Avengers of the AHS universe? Read more of Thrillist's extensive American Horror Story: Roanoke recaps here. Wes Rendar is a contributor to Thrillist. He loves American Horror Story.